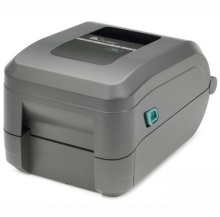 Providing enhanced performance and reliability at a competitive price, the GT820 direct thermal thermal transfer desktop printer offers a wide range of advanced features to meet a variety of low- to medium-volume printing applications. These include productivity-enhancing features such as a 300 meter ribbon that limits downtime by requiring less-frequent replacement; fast, 127 mm per second print speed; powerful 32-bit processor for fast label throughput; and a large memory for faster processing plus support for more graphics and longer labels. Built with Zebra quality and durability, GT820 is designed for versatility and easy integration, with a flexible choice of connectivity interfaces, as well as co-resident EPL™ and powerful ZPL® programming languages for compatibility with all Zebra printers. With support for media widths up to 114 mm, the GT820 is ideal for many applications including those requiring wider media.